Bike setup #1: Osprey Packs Escapist 20 backpack, Everything Bags, handlebar roll, frame bag, panniers and trunk bag on rear rack (click to enlarge). 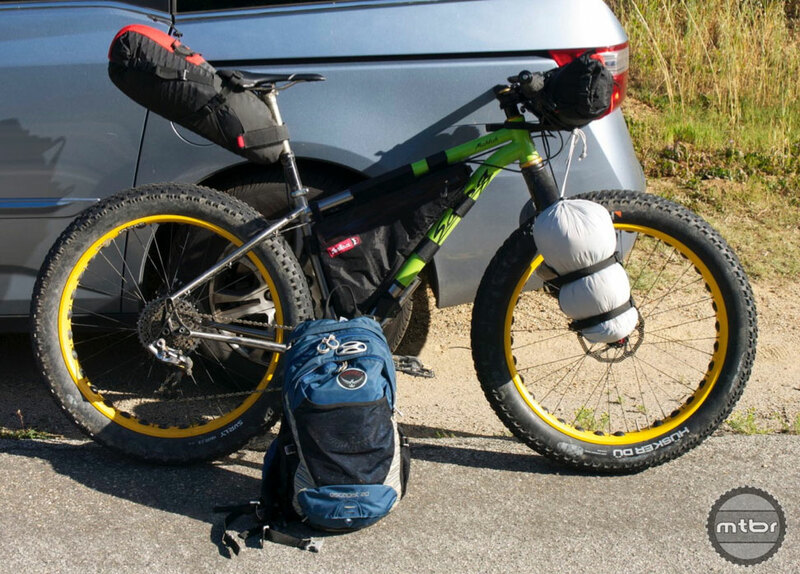 Editor’s Note: Inspired by the #everythingisaero mantra, our resident tech head dared answer the question that no dared ask before him: Which bikepacking setup is most aero? 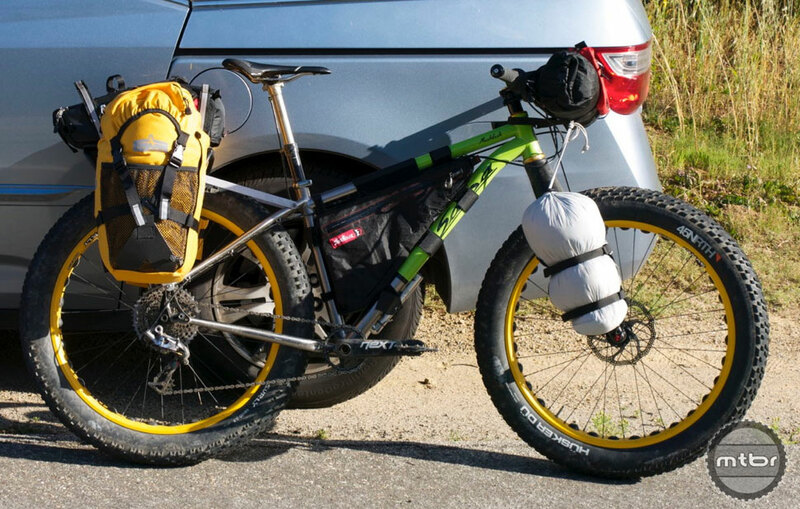 This article is to answer the burning question of how aerodynamic bikepacking gear is. Most people think that aerodynamics don’t matter when you are only going 12mph, and they would be correct. But studies have shown that if the wind is blowing 72% of the time it is a headwind. And riding 10mph into a 15mph headwind is the same aerodynamically as riding 25mph. 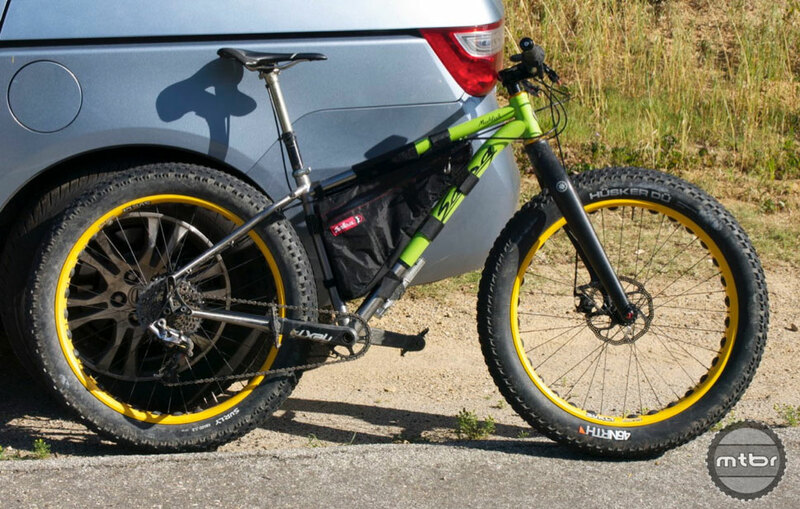 The testing was done on a fat bike, since that was the only mountain bike I have that has a rack. Since I don’t have an wind tunnel or a power meter my only real choice for testing was coasting down a hill. One of the things that I was worried about the testing was that when I added gear to the bike it would add weight which would also increase the force accelerating the bike. Especially since just about all of the items needed something in them in order to hold their shape. I tried to find the lightest things to put inside the bags that I could. I also decided to weigh about 219 lbs with my gear on, which makes the weight of the bags less important. I drew the line at filling the tires with water. Bike setup #2: Everything Bags, handlebar roll, frame bag, seat pack, backpack. Bike setup #3: Everything Bags, handlebar roll, frame bag, seat pack, backpack. Bike setup #4: Frame bag, seat pack, backpack (click to enlarge). Bike setup #5: Frame bag (click to enlarge). Clint Callahan used to mountain bike just after the dawn of mountain biking. After a long hiatus he was drawn back into the sport while shopping for a 20” bike for his son. He can appreciate and enjoy new bicycle technology while at the same time admitting that it doesn’t make him any faster. While still working on riding better, at some point in each ride he gives up in the constant battle with his internal speed governor and has a great time anyway. I only clicked on this thinking it was an April fool and might be funny. The former, I’m still not clear, I think that’s an indication of something wrong with the bike world when an article about something as stupid as fatbike-packing aerodynamics could be a serious article. I hope you don’t vote. You’d be way more aero with some rim strip on those HR Darryl’s.